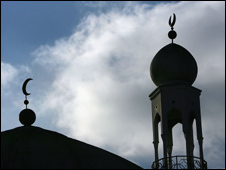 In Switzerland some 115,000 people have signed a proposal to ban the building of minarets. The campaign is being organised by the right-wing Swiss People's Party (SVP), the largest party in parliament. Under Swiss law, a group can request a national referendum if it manages to collect 100,000 signatures. The SVP claims the minaret is not needed for worship, but is a symbol of Islamic law, therefore incompatible with the Swiss constitution. Buildings with minarets, they argue, symbolise a "political-religious claim to power, which challenges fundamental rights". Islam, they say, "places religion above the state and... completely contradicts the federal constitution". The campaign wants to force a nationwide referendum on the issue which, under Switzerland's system of direct democracy, would be binding. The country's Foreign Minister Micheline Calmy-Rey has said the government will oppose the text. The Federation of Churches also called the move "inappropriate". "Polarisation is a bad thing. We should be working on integration," it said in a statement. The move has shocked Switzerland's 350,000 Muslims, many of whom have been campaigning for decades for more recognition for their faith. In theory, Switzerland is a secular state, whose constitution guarantees freedom of religious expression to all. In practice, however, correspondents say that mosques in Switzerland tend to be confined to disused warehouses and factories. Across the country, there are only two small minarets, one in Zurich and one in Geneva, neither of which can be used to make the call to prayer. In Switzerland's capital Bern, the largest mosque is in a former underground car park.